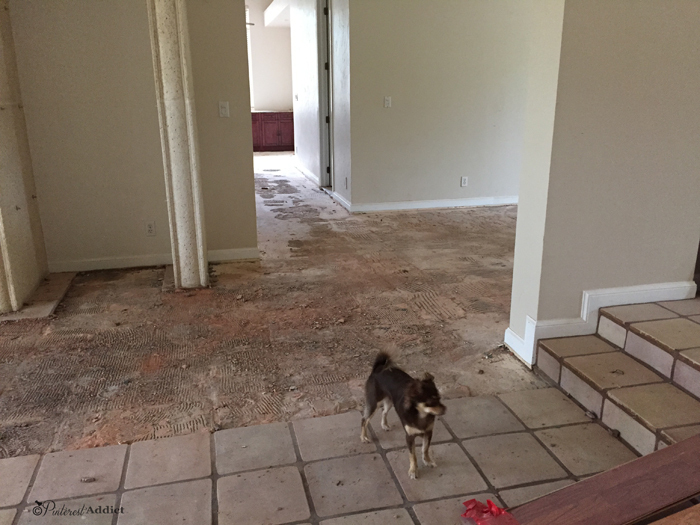 Removed all the floors in the house. Except for our master bathroom. We removed every inch of the whitewashed saltillo tile. Luci was overseeing the job. That took about a week. First they had to remove the tile, then remove the glue or thinset underneath. It was a long, dirty, dusty, LOUD process. 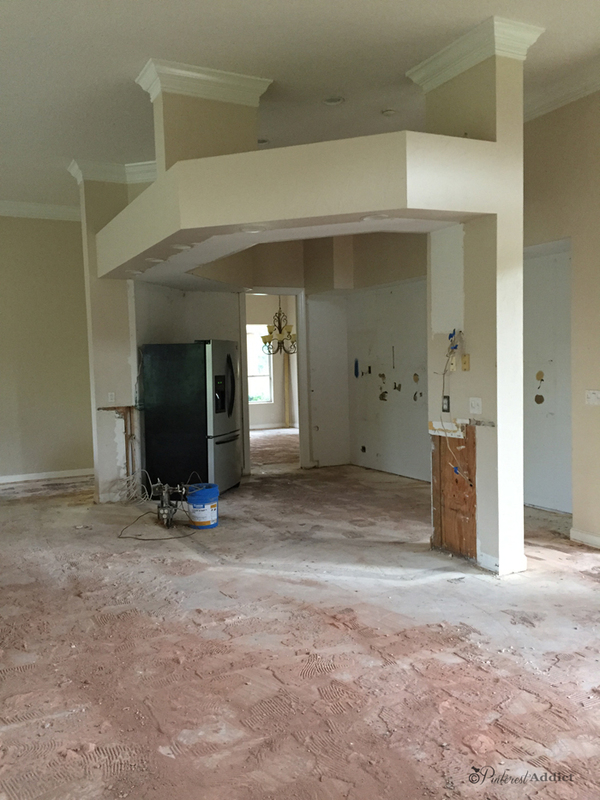 Removed entire kitchen and walls that enclosed the space. In this picture, they had already removed the upper cabinets above the sink area. 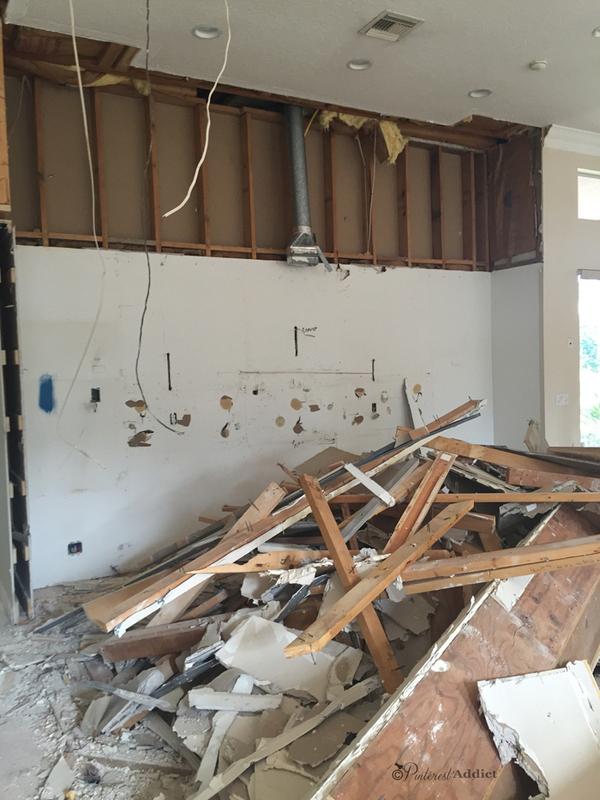 At this point, all the cabinets were removed. 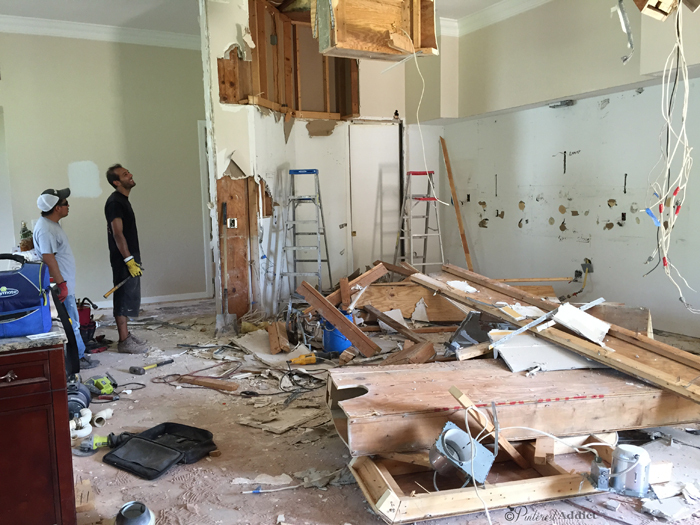 And then it was time to bring down the walls… what a mess! I don’t have a picture of the demo’d bathroom, so just imagine this torn out. 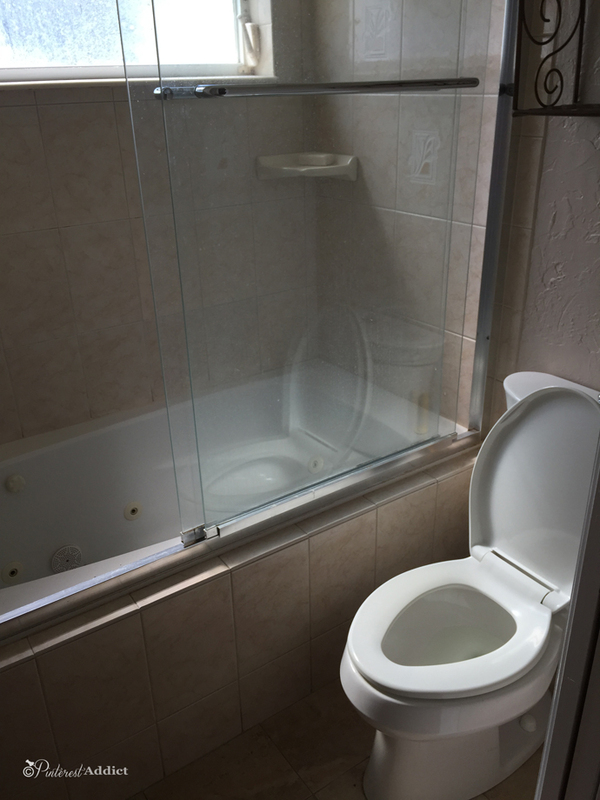 We chose to take the tub out completely because, well, I hated everything about it. It was super tall, didn’t work, was ugly and my kids never take baths, always showers. We are putting 12 x 24 tiles on the walls and floor, and a pebble floor for the shower. 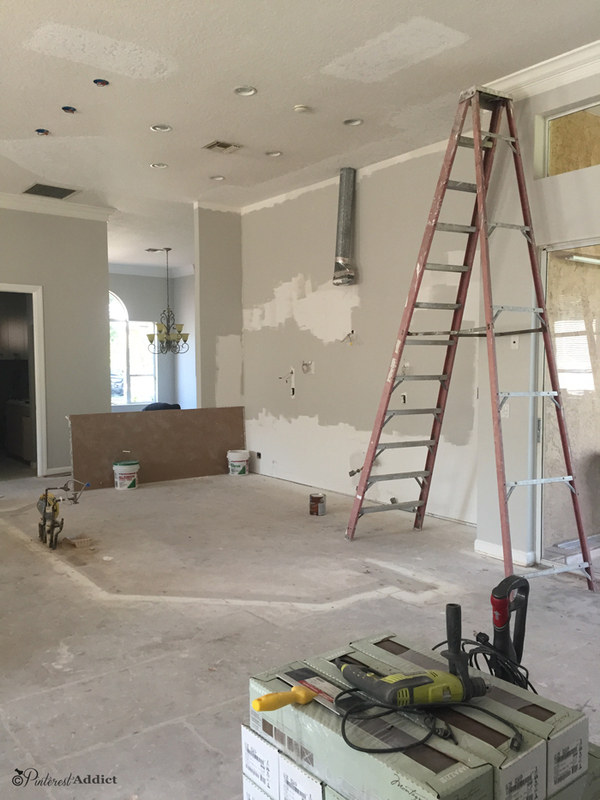 It will also be getting a new countertop, toilet, etc. It’s about 75% complete, and I’m super excited to see how it will turn out. 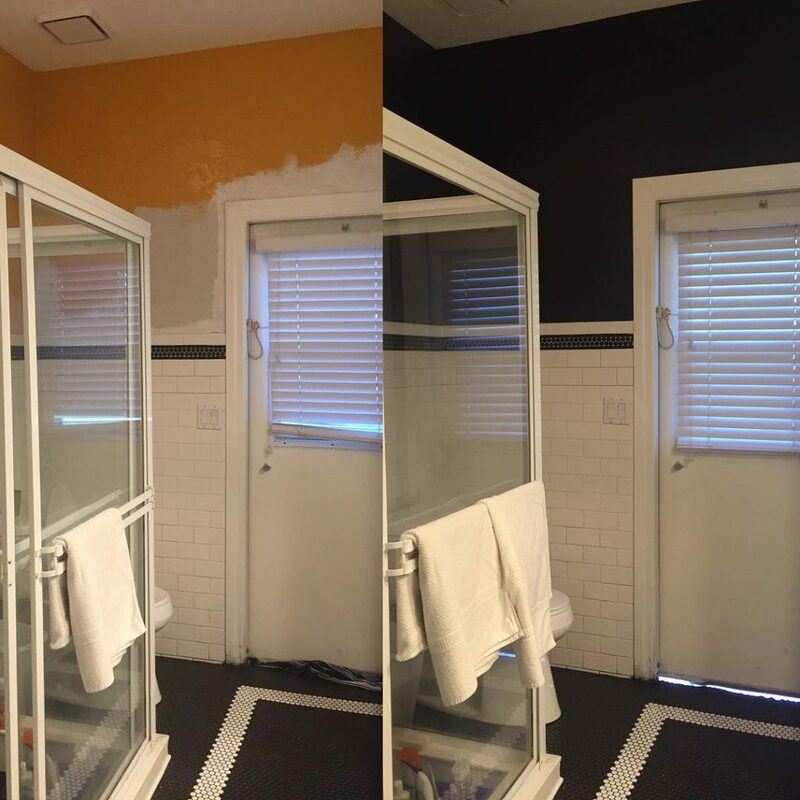 Painted the entire house, with the exception of one room (the office). During and after of the cabana bath from this morning. Loving the progress so far, but it’s got quite a long way to go. If you follow me on instagram, you have seen that picture already. When the time comes for me to post on each room, I’ll try to find a before to show you for each space. This cabana bath has had new penny tile installed on the floors and in the shower, it’s been painted and a new toilet was put in. This bathroom will be getting new granite countertops too. And a new door has already been bought, just not installed yet. Cleaned up the overgrowth in the yard, and took out numerous trees and stumps. Again no pictures, sorry. But let’s just agree that it looks so. much. better. At some point, I will try to get myself organized and find the pics I took before. Don’t hold your breath though, I lost a bunch of pictures from my phone somehow. Except for two bathrooms, all of the floors in the house have been re-tiled. We used the same tile that we had in the old house (if it ain’t broke, don’t fix it) but this time we went with a true herringbone pattern, so they look like “w’s” not “L’s”. I love it. Unfortunately, since we are still under construction around here, and not fully unpacked, they get dirty in a New York minute. So, here’s the best picture I have of them for now. 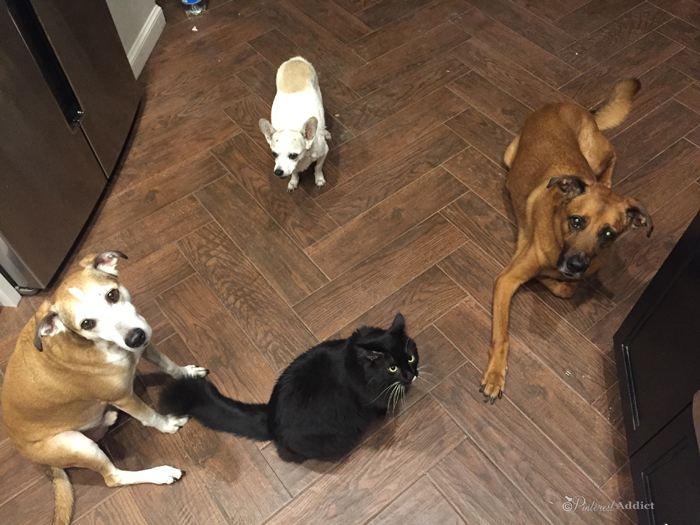 Some of the animals decided they needed to watch me eat a sandwich and take the photo. It’s nice to have fans. 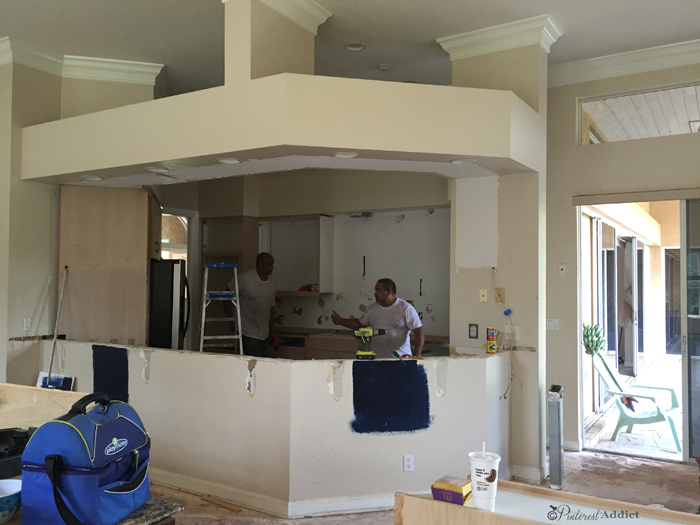 The cabinets in the kitchen are installed, but we are waiting on some final tweaks to happen. We are having our counters installed on Friday, so I’m hoping to have the tweaks completed before they come. I will share the kitchen with you when it’s all put together. I’m still trying to figure out what kind of backsplash to put in. So many options, only one kitchen… sigh. And of course, my favorite finished part so far, the front entryway! So, that’s the progress so far. Check back soon to see what else is happening. This is incredible! Look at all the progress you’re making!! I’m SO jealous- Lol! Miss you tons! I want to come help pick backsplash!! OMG, love the entrance floor!! I always told you of your excellent taste and your determination. I’m sure the renovation has been painful but you will SUCCEED once again! I’ll come by the week of the 21st for a visit!! 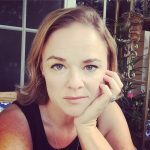 Wow, you really took on an enormous project!!! Simply love the front entranceway floor, super cool and different. So excited to see everything finished! Great job, Eliesa, as always! I LOVE LOVE LOVE your front entrance hallway! Awesome choice !!! Love the entry way! 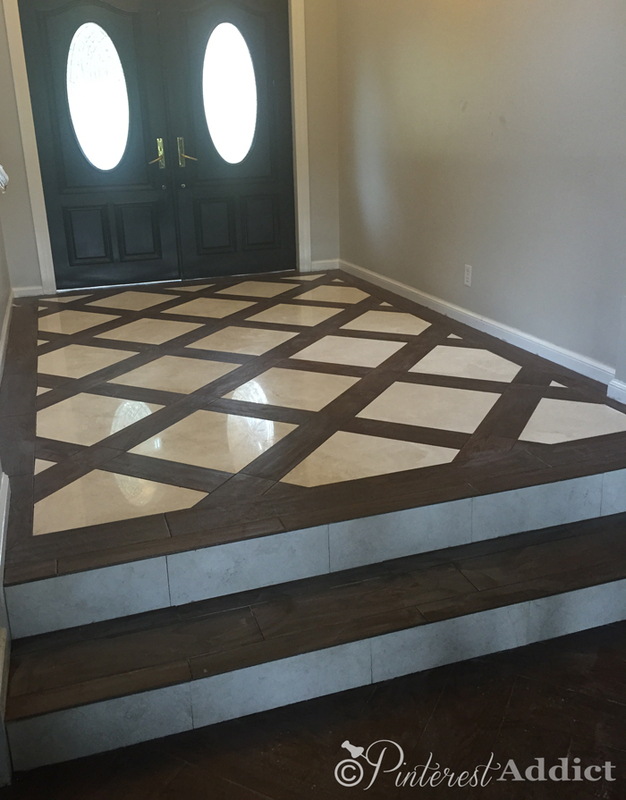 Was thinking of doing tile on my steps but did not know how to do the edges? Can’t tell from pic. Did you use a bull nose tile? Where did you purchase the wood look tile? Thanks you! !